Spaghetti with rose and sunflower petals. 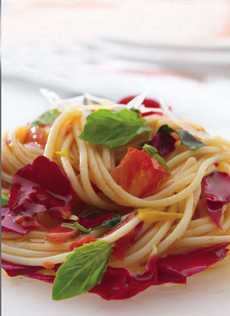 This recipe is in the book, “Spaghetti,” by Carla Bardi. While some everyday flowers are edible, not all are safe; don’t assume that you can pluck anything from your garden or the arrangement on your table and toss it into a dish. Even if you’re sure a flower is edible, be careful where you get it: don’t count on the local florist as a safe source, since flower-shop flowers are often grown with pesticides. Flowers are only edible if they are either organically grown or treated with organic pesticides like those used on fruits and vegetables. 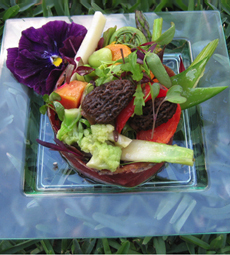 If you’d like to share other online sources for edible flowers, use the Contact Us link on this page. 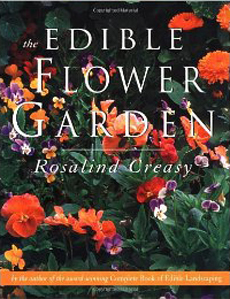 Grow your own edible flowers with guidance from The Edible Flower Garden. Baked Goods: Bake fresh petals into breads, muffins and pastries for hints of floral flavor and hues. They’re especially gorgeous in delicate angel food cakes or cupcakes. You can garnish them with fresh strawberries and whipped cream and a few more blossoms for a stunning dessert. Candied Petals: Find a recipe for crystallized flower petals. You can use them to accent cakes, puddings, cocktails and as a general garnish for dessert plates. Cocktails, Fizzy Drinks & Hot Beverages: For visual beauty or as a palate pleaser, flowers always look and taste great when dressing up drinks. Float a blossom on top after you’ve poured the drink. General Garnishes: Glamorize other foods from baked potatoes to cupcakes for extra glamour. 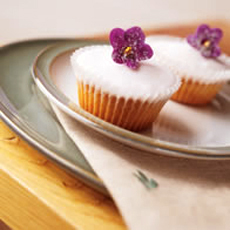 Cupcakes with candied violets, shown on Denby Pottery Company’s Regency Green dessert plate. Ice Cubes: Distribute petals in your ice tray, fill with water, and freeze. Serve the flower ice cubes with iced tea or any chilled beverage. Match petals to blended teas: try white tea with rose ice cubes to cleanse the palate, or black Ceylon tea with violet ice cubes for vitality. Jams, Jellies & Syrups: Some artisanal jelly makers use flowers for extra-special results. You can garnish plain jellies at the table by mixing in petals. Mayonnaise: Add colorful flowers to mayonnaise for stunning lobster, crab, and shrimp salads (peppery nasturtium is a particularly good match). Rubs: Rub crushed petals into game or lamb for bold color and taste. Stir them through couscous for an aromatic dish. Soups: Sprinkle flower petals on bisques and soups to garnish with color tones and taste; or stir them in to enhance consistencies. Stir-fries: Chop or sauté petals with meats and vegetables for a fresh twist on a traditional meal. One gorgeous salad: a radicchio boat filled with yellow beets, morels, microgreens, scallion, endive, fiddlehead ferns, Roman cauliflower and a purple posy. Beautiful serving plate available at SweetFlavorFL.com.